In this image, Mercury's northern horizon cuts a crisp line against the blackness of space. The surface in the lower right corner of the image is near Mercury's terminator, the line between the light dayside and dark night side of the planet. Looking toward the horizon, smooth plains extend for large distances, similar to volcanic plains seen nearby during MESSENGER's second flyby of Mercury. A NASA spacecraft that completed its third and final flybyof the planet Mercury yesterday, snapping new pictures of the innermost planet,had a small data hiccup that has delayed release of the images, mission engineerssaid today. The MESSENGERprobe skimmed just 142 miles (228 km) above Mercury at its closest approachas it whipped around the planet during the flyby, the last of three designed toguide the spacecraft into orbit around the planet in 2011. The spacecraft did snap several new images of the rockyplanet on the inbound leg of its close approach. "We do have some new science from the flyby," saidMESSENGER project scientist Ralph McNutt of Johns Hopkins University AppliedPhysics Laboratory. MESSENGER also took snapshots during its close approach, but"we had a little bit of a hiccup in the data" that has delayed therelease of those images, said Eric Finnegan, systems engineer for the missionat Johns Hopkins APL. "It's coming," he added. The anomaly appears to have happened right around thespacecraft's close approach, so there may not be images from the outbound leg ofthe journey, McNutt said. "We missed a little icing on the cake," McNutttold SPACE.com. Despite the hiccup, the spacecraft is in good health,Finnegan told SPACE.com. "What is important is that the spacecraft and theinstruments are healthy," McNutt said. The team is sifting through all the data and new images tosee just how much they got before the glitch, McNutt added. "We're all working through this," he said. MESSENGER made its closest approach to Mercury at about 5:55p.m. EDT (2155 GMT) when it sped by at about 12,000 mph (19,312 kph). The probethen flew behind Mercury,passing out of communications with Earth for about an hour before restoringcontact. Mercury's gravity was expected to slow MESSENGER by about6,000 mph (9,656 kph) during the flyby and place it on track to enter orbit inMarch 2011. The $446 million spacecraft flew by Mercury twice in 2008 tomap the planet in unprecedented detail while using the rocky world'sgravitational pull to refine its flight path through space. The spacecraft is the first probe to visit Mercury sinceNASA's Mariner 10 mission in the mid-1970s. 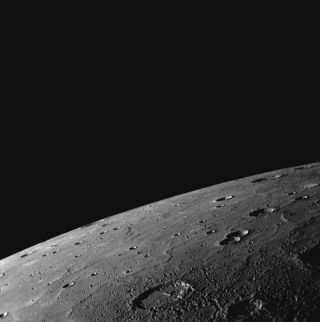 When MESSENGER arrives in its final orbit around Mercury, itwill begin a long-awaited observation phase that will complete its new maps ofthe planet. NASA launched MESSENGER - short for MErcury Surface, SpaceENvironment, GEochemistry, and Ranging - in 2004. The probe swung past Earthonce and Venus twice before beginning its three Mercury flybys.